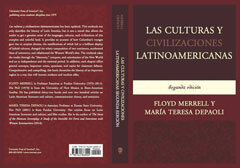 María Teresa DePaoli, associate professor of modern languages, and Floyd Merrell published "Las Culturas y Civilizaciones Latioamericanas." The text not only describes the history of Latin America, but it sets a mood that allows the reader to get a genuine sense of this complex and colorful land. The text provides an account of Columbus' voyages, and all that followed. These gave rise to utopian dreams, which led to a brilliant display of fused ethnicities, culinary traditions, new customs, lifestyles and artistic creations, as well as commerce between two continents — Europe and America — that helped pave the way for the coming industrial revolution and its consequences. "Las Culturas y Civilizaciones Latinoamericanas" begins with an overview of Latin America's topographical features, and a discussion of pre-Hispanic cultures. Then, it discusses the "discovery," conquest and colonization of the New World. It continues with the Independence and the national period, from the 19th century to the present. Instead of packing the reader's mind with labyrinth of facts, the goal is to create a general mood that allows a more effective sense of Latin America's cultures and civilizations. The text maintains a focus on Latin Americans' everyday life, their sentiments, predispositions and thought, as they go about organizing and conducting their affairs.